Badges were used by railroads to both designate authority and indicate employees' occupations. These functions were especially necessary because of the many different occupations that railroads used as well as the large geographical size of their territories. Employees who performed the same jobs over perhaps hundreds of miles needed some way of indicating their authority to customers and the general public. Badges were a major means of doing this. Railroad badges generally fall into two major categories: cap badges and police badges. Almost all railroad employees used cap badges to designate occupation as a part of their uniforms, and this was by and large associated only with railroad passenger service. In the U.S., the practice of requiring uniforms did not begin with railroading but was instituted some time afterwards. In 1888 the "Railroad Gazette" noted, "The wearing of uniforms has been introduced from England, and is, in the main, a good feature, though some roads whose discipline is otherwise quite good, allow their men to appear in slovenly and even ragged clothes." * As passenger railroading grew in scope and complexity, the number of occupational categories grew accordingly. Today, railroad cap badges can be found with a wide array of job roles. The fanciness of these cap badges also varies widely. Some badges can be very plain, while others can be quite colorful and ornamented. One occupational category, railroad security, tended to use a different style of badge -- a "police style" badge. This was presumably in keeping with what their counterparts in civil law enforcement wore. Railroad police badges are often shaped like stars or shields and can be quite fancy. They can be found for a variety of security-related jobs, including special agent, detective, watchman, chief, and just plain "police". As collectibles, badges have a special appeal because they were normally used by individual, specific employees. Many badges were made with a high degree of craftsmanship, were sometimes nickel-plated or nicely enameled, and were frequently marked for the railroad on which they were used. Unfortunately because railroad badges are highly sought after and relatively easy to produce, they have become particularly susceptible to counterfeiting. Some of the original manufacturers are still in business and continue to produce badges for both the professional and hobbyist markets. Therefore, collectors need to be especially careful and more suspicious about authenticity than with other railroad collectibles. The cap badges below illustrate the variety and styles to be found among this category of collectible. A separate page shows railroad police badges. Unless otherwise noted, the cap badges shown on this page are from the collection of Bill Kajdzik who generously provided the digital scans (Thanks, Bill!). Note the wear and patina on these badges, a good indication of authenticity. Above right: Uniform hats at the Gaithersburg railroadiana show. Above: A conductor badge from the Brockton Street Railway. The badge is made of leather with a silver oval frame but no hallmark. Collection of Phil O'Keefe. Above: An ornate Conductor badge from the Brockton Street Railway which operated lines in the south suburbs of Boston from the early 1890's to about 1901. Collection of Phil O'Keefe. Above: A Conductor badge from the....Disneyland Railroad. Hey, a railroad is a railroad! Above: A Brakeman badge from the New York Central Railroad. The New York Central was another railroad noted for elegant passenger service. Above: A Conductor badge from the Missouri River & Bonne Terre Railway, which no doubt had a very small passenger service. Above: A Conductor badge from the Great Northern Railway, somewhat plainer than the other conductor badges shown here. Above: A Conductor badge from the Atchison, Topeka & Santa Fe Railway. Click on the image for a larger view. Above: A Conductor badge from the Baltimore & Ohio Railroad featuring the B&O's famous "Capitol Dome" logo. Above: A Conductor badge from the Chicago, Milwaukee, St.Paul & Pacific Railroad, A.K.A. the "Milwaukee Road". Note the enameled logo. Above: A Conductor badge from the Missouri Pacific Railroad. Click on the image for a larger view. Above: A Conductor badge from the Chicago, Burlington & Quincy Railroad. Above: A Brakeman badge from the Missouri Pacific Railroad. Above: A Brakeman badge from the Atchison, Topeka & Santa Fe Railway. Above: A Brakeman badge from the St. Louis, Iron Mountain & Southern. Above: A Brakeman badge from the Northern Pacific Railroad, showing some beautiful enameling. The NP had great pride in their passenger service. Click on the image for a larger view. Above: A Brakeman badge from the Great Northern Railway in the same style as the Conductor badge above from the same road. Above: A beautiful Fireman badge from the Southern Pacific Railroad. 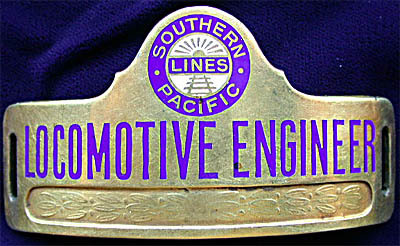 Above: A beautiful Engineer badge from the Southern Pacific Railroad. Click on the image for a larger view. Above: A Fireman badge from the Union Pacific Railroad. Above: An Engineer badge from the Missouri Pacific Railroad. A hearty thanks to the collectors who contributed text and photos for this page. * As quoted in Klamkin, Charles. Railroadiana: A Collector's Guide to Railroad Memorabilia. Funk & Wagnalls, New York, 1976, p. 89.